It also offers online case scenarios on autism, ADHD, school refusal and truancy, cerebral palsy and child abuse and neglect. The cases are followed by questions to test the acquired knowledge of the student on these topics. This practical guide to child development is ideal for trainee paediatricians, registrars, paediatricians and general practitioners. Clinical Senior Lecturer Discipline of Paediatrics And Child Health, Faculty of Medicine, University of Sydney. Consultant Developmental Paediatrician, Child Development Paediatrics Private Practice, Pennant Hills, Sydney. "The publication of Clinical Handbook on Child Development Paediatrics represents an extraoridnary effort to c onsolidate the normal and abnormal development of children with practical applications for helping the child and family through all areas of the developmental process...This book will be a very useful resource across the world including resour e poor setting, among edical doctors including trainees and general practitioners, among paediatricians especially general paediatricians and paediatric neurologists." "A sound understanding of the basis and practice of the normally developing child is key to the management of children. Traditional training programmes in paediatrics are largely hospital based and by necessity focus primarily on the life threatening medical disorders. Less exposure is received by trainees in the disciplines spanning the diagnosis and management of chronic disabling illness. In A Clinical Handbook on Child Development Paediatrics, Dr Johnson has rallied a group of professionals who are experts in their field and who have collectively covered the important general principles of the developmental paediatrics as well as giving more in depth approaches to some of the key developmental disabilities. 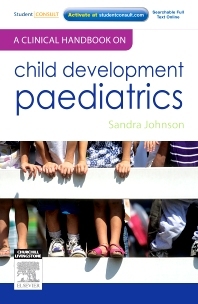 "I have read Sandra Johnson's handbook and found it to be quite outstanding, it is the ideal reference for any Paeditrician, particularly for those contemplating work in general Paediatrics or community settings. The clear layout and helpful tips make it very easy reading and an excellent reference book. I would strongly advise this be used by Paediatricians and even trainees from the very outset of their training. It is a beautifully balanced book reflecting the authors practice and experience and one I found inspiring. Sandra Johnson is obviously a person who is deeply committed to her vocation and this is reflected in this book." Professor Simon Clarke, Clinical Associate Professor, Paediatrics and Child Health, Children's Hospital, Westmead, Director Adolescent Medicine, Westmead Hospital, Westmead, NSW, Australia. "This is a well written and accessible book which addresses the assessment and management of developmental problems in children. It is written in a style that is both comprehensive and very user friendly - the layout is clear, the content succinct yet comprehensive, and there are at the end of each chapter suggestions for further reading and useful websites. This handbook is grounded in evidence and experience, with the content extensively referenced and numerous ‘practice points’ informed by the author’s vast clinical experience. This book is likely be a very useful resource for practising and trainee paediatricians, interested general practitioners, and other professionals whose work involved developmental conditions. It is highly recommended." Professor Frank Oberklaid, Director, Centre for Community Child Health, The Royal Children's Hospital Melbourne, University of Melbourne, Murdoch Childrens Research Institute, VIC, Australia. "Sandra Johnson, a highly experienced developmental paediatrician and teacher based in Sydney has responded to an important deficit in texts available to paediatric trainees in Australia. That she has succeeded is undoubted, but she has gone further in producing a book which could reasonably be useful for paediatricians in general. It is available in two forms - a soft cover book and an online module with case studies for testing understanding of the topics. Sandra is the principal author and she has brought together a group of her colleagues to contribute to chapters in their areas of expertise. The book has a foreword and recommendation by internationally renowned British paediatrician David Hall, to emphasise the book's importance...Each chapter has a useful format, beginning with definitions and concepts and proceeding to an approach to assessment, relevant investigations, management, practice points, an extensive list of references and recommendations for further reading...I have no hesitation in recommending this book." Chris Pearson, Chair, Child Development and Behaviour SIG, Chapter of Community Child Health, RACP News, December 2012.